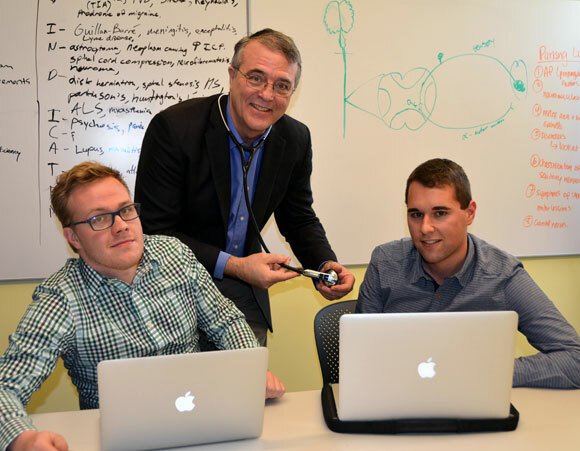 Dr. John Falconer demonstrates the Littman electronic stethoscope to second-year medical students Kurt Hoskin and Matt Mittelstadt. Using Bluetooth technology, students at UBC’s Okanagan campus can ‘hear’ the heartbeat of a patient in places like Trail. John Falconer still confesses a certain excitement when he holds a brand new, electronic tele-stethoscope in his hand. Falconer, a neurologist for more than 20 years, is the Foundations of Medicine director at UBC’s Southern Medical Program (SMP). As the leading force behind the school’s e-Health Research Office, he says new technology has changed the telehealth game considerably. Technology advances in e-health directly benefit patients in remote communities, extending the reach of physician specialists and health-care practitioners in timely fashion. Savings are measured in less time spent waiting for diagnosis, driving to large urban centres and fewer overnight stays for patients who travel long distances. UBC admits 288 medical students each year for study in Vancouver, Kelowna, Victoria, and Prince George. While some of their learning is done via videoconferencing, Falconer says today’s medical students -- tomorrow’s doctors -- will eventually see and treat patients by videoconferencing. And the e-Health Research Office provides an opportunity for UBC’s students to participate in advanced technology research. Partnered with UBC Vancouver’s e-Health Strategy Office and the Interior Health Authority, the e-Health office focuses on three key research themes: education, telehealth, and electronic medical records interfaces. Falconer runs a teleneurology clinic with physicians in Trail, Creston, and Grand Forks from his UBC Okanagan office, and has students shadowing him to learn how it is done. The Southern Medical Program’s e-Health Research Office is also conducting an e-Health research project with telehealth patients -- 50 people in a remote community will be seen in person by a doctor, while 50 others will participate in telehealth conferences, where they will contact the doctor via technology. Using Bluetooth technology, Falconer demonstrates how the Littman electronic Tele-Stethoscope connects wirelessly to a computer and shows how a medical practitioner in Kelowna, can ‘hear’ the heart and lungs of a patient in Trail. This one device will save countless hours and dollars, while eliminating the stress of travel for patients.